A story we know so well. Two women befriending each other at an anxious time. Mary goes to Elizabeth – will they believe us? Mothers of two sons to come. Both in strange situations. The neighbours will take over…. What will they say? Imagine the grapevine of Nazareth and of En Kerem? What will they say — Ireland was ruled for years by the neighbours. Heard of a lad who left Maynooth and couldn’t go home, or a family member – ‘sure we all knew he was an alcoholic’. In faith we need support and help of each other. Opinions when they hear I go to Mass? What will they say if I go pro-life? My son is giving up a good job and off to Africa with him for a few years volunteering? What will the neighbours say? It can be lonely to take faith seriously. Among colleagues, or in the family where none of the younger seem to care, in the family where they next generation is not baptised, when people just scoff at our faith in heaven…we need to practise faith together. Mary and Elizabeth had faith secrets and faith promises and needed each other. We all need visitations in our faith lives. No football team practices in its own. So you have the two women. Shepherd come in pairs, and the wise men in threes. We do not go with God or to God on our own. Faith is personal but not private. Faith shared brings life. 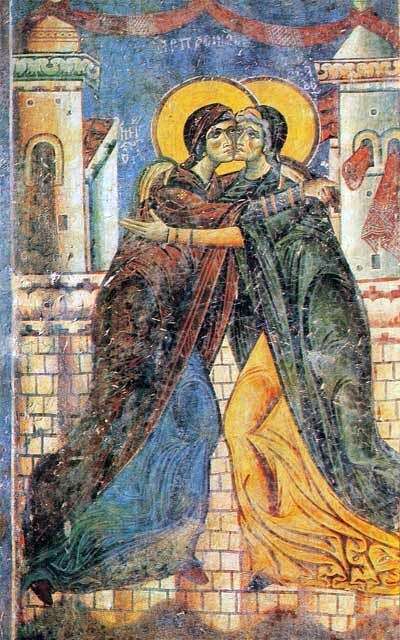 The visitation gives an example of faith shared and renewed in prayer. Mary and Elizabeth – Blessed are you among women. This entry was posted in Gospel of Luke, Gospel Reflection, Liturgy Resources, Prayer Resources, Scripture, Year C and tagged Christmas, December 20th 2015, Donal Neary SJ, Elizabeth, Faith, Fourth Sunday of Advent 2015, Gift and Challenge, Gospel Reflection, Jesus Christ, John the Baptist, Luke 1:39-45, Mary, pregnant women, preparation, Sharing faith, Son of God, Son of Mary, Visitation, women of faith, Zechariah.